"Enter the ancient and corrupt city of Tyr, whose tyrannical sorceror-king has ruled for a millennium. As you wander the city, from the wreck of the elven warrens to the sanguine splendor of the arena, you realize that the citizens of Tyr thirst less for water than they do for freedom. Now, after a century of slave labor, sorceror king Kalak's great ziggurat nears completion. He has promised the city a grand celebration when the monument is done, complete with the most brutal arena spectacle in Tyr's long history. Rumors abound as to the nature of the spectacle: some believe it will bring with it the longed-for manumission of countless slaves; others fear the annihilation of Tyr and her people as a sacrifice to Kalak's hunger for power; and a secret few believe it will be a day of revolution - a day of freedom! 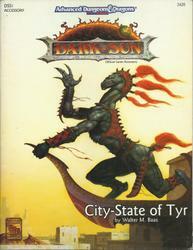 Designed for four to seven players of starting levels, the DM's Book and Player's Book inside this pack provide the DARK SUN game DMs with a campaign base in Tyr, and give PCs a brutal introduction to Athas." "'Tyr is free! Tyr is free!' Such is the heady cry that echoes from the darkest warrens to the gleaming chambers of the Council in that ancient city. Now is your chance to savor life released from the oppresive gloom of the sorceror-kings - but for how long? New forces threaten the newly-born independence of Tyr, as outside forces march upon the city. King Tithian is determined to resist, but there are others on the Council of Advisors less eager to risk their wealth and lives for the cause of independence. It falls upon you to help mobilize and lead the citizen-army of Tyr on the road to Urik. Designed for four to six characters of 4th to 7th level, Road to Urik is set in and around Tyr, the campaign base for your DARK SUN game. A stand-alone adventure, Road to Urik can also be played as the sequel to Freedom." "Tyr has been freed, and the mighty army of Urik has been turned back. These are new and strange times, indeed. Now Urik has become home -- at least for a while -- and there are new markets to shop, new streets to explore, and, oh yes, preservers to meet. Preservers, the keepers of good magic, have sent a mysterious summons. They are ready to embark on a new and dangerous plot to thwart sorceror-kings and bring new life to Athas. To associate with preservers is dangerous to say the least, but when the king's templars uncover the schemes, a death mark falls upon all involved. Will a desperate journey across the wastelands, with the templars in hot pursuit, end in victory or chaos? The answers lie in the hearts of mighty heroes and the recesses of Arcane Shadows. Designed for four to six characters of 5th to 8th level, Arcane Shadows is set in Urik. A stand-alone adventure, Arcane Shadows can aslo be played as the sequel to Freedom and Road to Urik." "The palace of the Forest Queen contains treasures unimaginable. To the sons and daughters of Athas's harsher climes, Gulg and the Crescent Forest seem almost perversely lush, a jumble of green and growing things hording precious water for the benefit of the few. But while basking in the glow of Lalali-Puy's gratitude, your characters have the richness of the forest at your beck and call. Of course, the Oba's sensibilities are easily bruised, and her nature is notoriously unforgiviing. Gulg's dank dungeons are only a staging area to a deadly ceremony, where the young nobles of the city chase prisoners through the forest to earn their places as lord of their city -- the Red Moon Hunt. Designed for four to six characters of 7th to 10th level, Asticlian Gambit makes them pawns in a dangerous game between the Oba of Gulg, the Shadow King of Nibenay, and mysterious representatives of the Asticles family of Tyr. 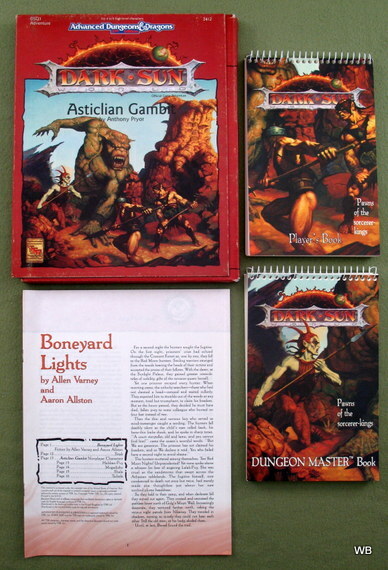 A stand-alone adventure, Asticlian Gambit can also be played as the sequel to Freedom, Road to Urik, and Arcane Shadows." "Out of the swirling, bone-dry sands of Athas come hordes of raiders. They overrun caravans, strip them bare, then vanish into the untracked wastes once more. Who are these ghosts of the desert? Where do they live? How do they survive far from the high walls of the city-states? Slave Tribes answers these and many more questions about the ex-slaves who escape into the desert. 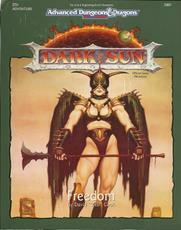 The DARK SUN game world is now open to campaigns in realms beyond the reach of the sorceror-kings. The most prominent and successful slave tribes of the Tyr region are presented in great detail in this accessory. 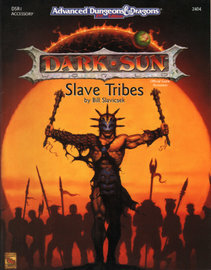 Slave Tribes enables the DM to create entirely new tribes to roam his DARK SUN campaign. It also shows players how to form their own tribes when their characters escape the clutches of the sorceror-kings. The deadly world of Athas shows no mercy to those who are unprepared for its dangers!" "In the harsh lands of Athas, even the bare necessities of life are hard to come by. The caravans of the traders ply the shifting sands, daring raiders and the elements to bring goods and hope to both the teeming hordes of the city-states and the isolated villagers in the trackless wastelands. Without the traders, life on Athas would be impossible. 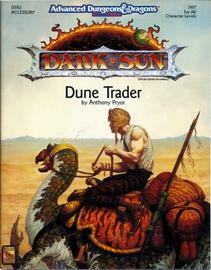 Dune Trader explores the lives of the people who are the lifeblood of Athas. The major merchant houses of the Tyr region are described, as well as minor houses, elven merchant and raiding tribes, and the mercantile tendencies of all the races of Athas. The personalities who drive these houses and tribes are detailed fully within these pages. A new character class is introduced here - the trader class. 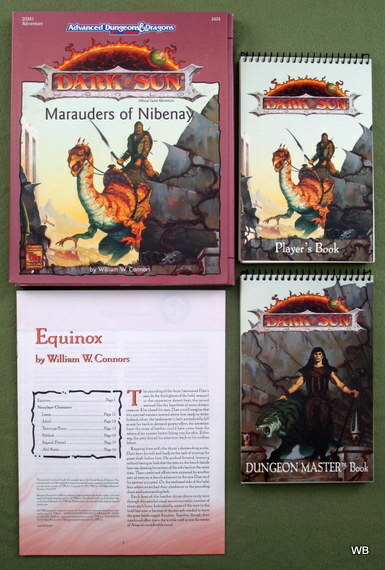 The DM receives complete instructions on how to run a trader-based campaign, and the players are shown how to play trader characters and start their own merchant houses. The most vital and exciting challenges on Athas await within this book!" "Few safe havens exist on Athas, and fewer still for preservers. In the hidden places of the cities - a potter's shop, a crematoria, even under the very palace of a sorceror-king - the Veiled Alliance abides, aiding and protecting preservers and auxiliaries, and standing against defilers. In Tyr, Balic, Draj, Gulg, Nibenay, Raam, and Urik, protection from the dark forces of Athas endures. Secret recognition signals preserve their identities. For those seeking membership comes a testing: after true intentions are proven, tests are administered and, if failed, leads to a terrible death. If successful, the candidate looks forward to years of perilous work and strife - the results of which may never see the pages of a journal. And no one quits the Alliance without facing requital. Veiled Alliance presents the DM with all the information required to create Alliance-centered campaigns on Athas -- detailed information about the five aims, adventure hooks for each Alliance, recognition signals, and maps of various headquarters. All the features you need to create thrilling, fundamental challenges to the Alliance on the ruthless world of Athas are now revealed." "For thousands of years a great and terrible secret has lain hidden in the depths of the Sea of Silt. In the heart of this vast dust basin, an endless storm of ash and shrieking wind guards the deadliest concentration of evil and power found on the dying world of Athas - the Valley of Dust and Fire. Valley of Dust and Fire more than doubles the known portions of the world of Athas. Intrepid explorers will discover new wonders and perils within the deadly Sea of Silt, from the beautiful island of Shault to the savage Mountains of the Sun. New rules for traveling the dust basin and surviving its many dangers are included. With luck and determination, a skillful and well-prepared party just might pass through the Great Ash Storm and enter the Valley of Dust and Fire. But this realm of shattered badlands and awful monsters is so deadly that only one man has ever reached the valley and returned to tell the tale." "Tyr has battled and bled for its freedom, throwing off the yokes of an insane sorceror-king and slavery. The city stands poised on the brink of democracy. but has Tyr the strength to seize the future and shape it in the image of that freedom, or has the city merely traded one form of slavery for another? City-State of Tyr addresses these matters and more. Within this 96-page booklet is the most complete, detailed description of Tyr's peoples, places, and plots ever. The premier city of the DARK SUN campaign setting now lies complete for an Athasian campaign's player characters. Learn the city's history, attend a Council meeting, wander the city's business districts, and explore the mysterious Under Tyr - the ancient ruins of the forgotten city upon which Tyr was built." "On a world with no gods, what do priests serve? The priest class on Athas is unique and distinct from the priest classes of any other AD&D world. Athasian priests worship no gods, collect no followers, and carry edged weapons. Earth, Air, Fire, and Water answers all your questions about this singular class of clerics. Here are the elemental priests who serve the elementals and Athas. They strive to return their barren and battered world to its former state of lush green valleys, forested mountains, and cool waterfalls. Here are the paraelemental priests who oppose the restoration of Athas, serving the paraelements whose power and might is growing as defiler magic continues to plunge Athas further into decay and ruin. New priest kits allow PCs to become an Athasian elemental priest of Earth, of Air, of Fire, or of Water - but they can only serve one, for the elements are jealous masters. Each kit contains unique powers, limitations, and proficiencies. Each offers four different ways in which to bring about the regeneration of Athas: as a Wanderer, as a Guardian of a shrine, as a City Cleric, or as a Shaman of a tribe. But beware the paraelemental priests - their success depends upon the failure of the elemental clerics!" "They run across the burning plains where others fear to walk. They live for the moment, these savages of a dying world. The elves of Athas are wild, dangerous, and unlike any other elves. Forget the frail forest dwellers of other campaign worlds. Athas's elves stand tall and lean, with long limbs and fearsome faces. They are thieves and raiders, swift warriors and terrible foes. 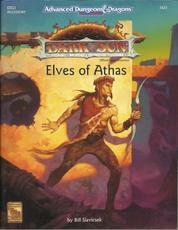 Elves of Athas explores the passions that drive them, the abilities that make them different from other races, and the outlook that lets them survive beneath the crimson sun. This accessory uncludes savage encounters with the better known tribes and an updated map of the Tablelands region. 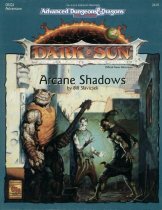 For players, there are new rules for character creation and new Athasian elf kits - offered to DARK SUN game characters for the first time. The elves of Athas are forged in the endless depths of the desert - burned dark by the sun, toughened by the swirling sand, and given strength and swiftness by the constant wind. Come run with them - if you dare!" 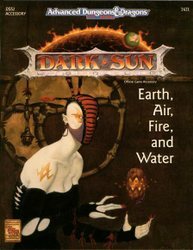 This epic adventure completes the series of DARK SUN™ flip-book adventures that began with Freedom and continued through Road to Urik, Arcane Shadows, and Asticlian Gambit. In this slip-case, you'll find three adventure books, a map book, and a snort story. The three adventure books should be used in the order listed below. When you open this box, tke first thing you will want to do is pull out Book One: Out of the Valley and read the introduction to the module. * Book One: Out of the Valley. This 96-page book contains three linked adventures that will begin the Dragon's Crown saga. 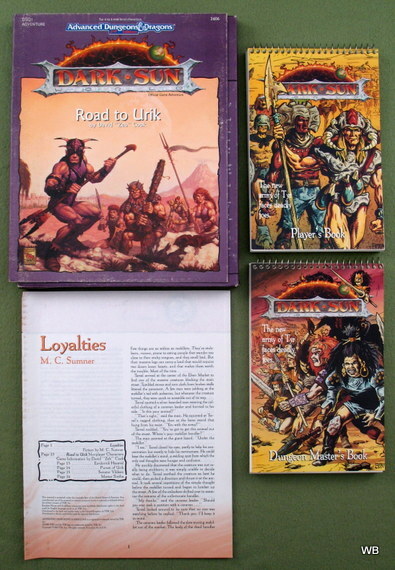 These adventures take the heroes to the camp of their old enemies, the Black Sand Raiders; to the fortress city of Urik; and to the mysterious Sea of Silt. * Book Two: The Road of Fire. This 96-page book contains the next three adventures of the saga. The heroes will journey to the uttermost end of the Tyr region, back, again to the forests of the halflings, and then onward into the trackless plains of the Hinterlands. * Book Three: Dragon's Crown Mountains. This 64-page book concludes the epic quest of the heroes, bringing them face to face with one of the most powerful and deadly secrets of Athas. * The Map Book: For your convenience, all detail maps referred to in tKe adventure books have been collected in a 32-page book of maps. * Poster Maps: Two of Athas's ancient fortresses, Akaracle and Dasaraches, are shown here. 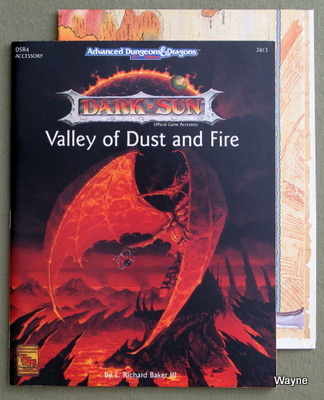 The Case Map: The map opposite this text is a reprint of a portion of the poster map included in the DARK SUN accessory Valley of Dust and Fire. It shows the farthest reaches of the Tyr region, to the north and east of Lake Island and Bitter Well. In Book Two, the heroes will journey to this lonely outpost of civilization." "A simple trip from Urik to Raam: What could be easier? But unexpected encounters and freakish sandstorms conspire to make this journey more dangerous than imagined. Lost and dying of thirst, your characters unwittingly involve themselves in a strange mission -- the motivation behind which lies hidden. On the adventurers' trail are enraged dragons, desert fiends, and a curse that threatens to drive them mad - or make them one of the walking dead. Their only hope is to enter the ancient ruins of Yaramuke, site of a great battle between sorceror-kings of ages past. Yaramuke... City of Black Waters. The very name curdles blood. 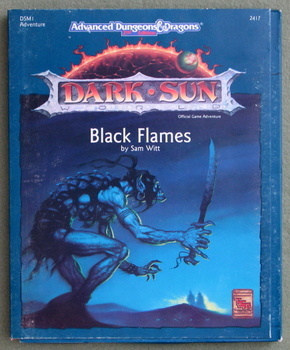 Designed for four to six characters of 3rd to 6th level, Black Flames is set in and around the remains of Yaramuke and the cities of Urik and Raam. Let your DARK SUN game characters experience new adventure among the ancient ruins of Yaramuke!" "In the city of Balic, an insidious new threat to the Tyr region has arisen in the shape of a humble beetle. Magically altered to deliver a psionic malady via their bite, the beetles have been used by templars, slavers, raiders, and worse to neutralize the psionic abilities of their captives and render them docile. In desperation, the Veiled Alliance has called upon your characters to track down the source of the sinister beetles and put an end to them. There's only one problem - the most powerful merchant house of the Tyr region is growing even wealthier from the parasitic trade! Merchant House of Amketch is designed for four to six characters of 4th to 7th levels. Explore the trade routes and intrigues south of the Estuary of the Forked Tongue, in the heart of the Tyr region! 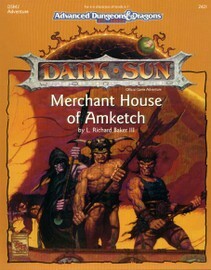 Merchant House of Amketch can be played as a stand alone adventure or as the sequel to Black Flames." "For centuries the Veiled Alliance has been a thorn in the side of the mighty sorceror-king Nibenay. Now the stars are right and the mysterious Shadow King has decided to rid himself of his unremitting rivals. But the Veiled Alliance is not easily defeated. They too have been watching the stars, and they know that the history of the great city has reached a crucial juncture. Both sides stand ready for a great battle, but neither is prepared for the disaster that looms over the city. By the time the sun rises again, the city will be in ruins and the task of rebuilding it will fall squarely on the shoulders of a small band of adventurers. The future is theirs to decide, for good or evil." "Unknown to even the mightiest of sorceror-kings, a fire is stirring deep beneath the barren soil of Athas. Sheltered by the titanic bulk of the Black Spine mountains, a terrible force has ripped open the very fabric of time and space. Now a shimmering portal stands open and a long-forgotten enemy assembles its sinister forces to invade the kingdoms under the dark sun. The only thing that stands in the way of this terrible fate is a band of heroes. Assembled from the four corners of this tortured world and bound together by the tangled cords of fate, they must face an enemy the likes of which they have never seen before. The odds are against them, but they dare not fail. The fate of the world is in their hands. 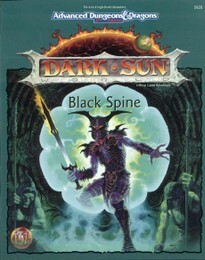 Black Spine is an adventure for 4 to 6 characters of 10th through 13th level. The previous flip-book modules (Black Flames, Merchant House of Amketch, and Marauders of Nibenay) precede this adventure, but they are not necessary to enjoy Black Spine." "Most adventurers know better than to listen to rumors. But when rumors spreak of a magical forest blooming deep in the burning stretch of the Alluvial Sand Wastes, even the most battle-hardened gladiator takes notice. A mysterious summons has gone out to the humans and demihumans of the Tyr region, luring them to the new forest and promising Athas's salvation. Now your characters have heard the call -- but will they heed the Forest Maker, ot seek to destroy her? Designed for four to six characters of 11th to 13th level, Forest Maker brings player characters from the sun-baked streets of Tyr to the walled fortress of Altaruk and beyond. 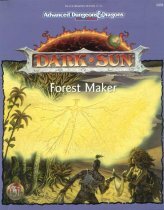 Forest Maker is a stand-alone adventure. 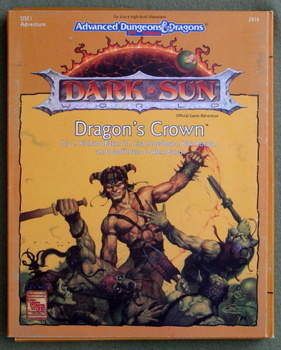 This latest in the DARK SUN series of adventures has been redesigned with standard-size booklets, one for the DUNGEON MASTER and one for the players. A third booklet provides a descriptive short story to set the tone of your adventure." 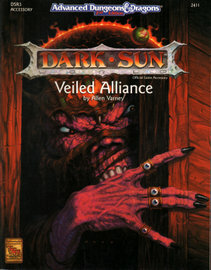 Wizards of the Coast owns (and holds trademark to) the AD&D game and Dark Sun in all forms.